Culms: Erect or ascending, solitary or few, stout, flattened, usually unbranched, glabrous. Blades: Firm, mostly flat, 2.4 to 28 inches long, 1/5 to 3/5 inch wide; lower surface glabrous, upper surface glabrous or sparingly stiff-hairy at base; margins rough; tips long-tapering points. Sheaths: About as long as internodes, keeled, glabrous or basal sometimes stiff-hairy. Ligules: Membrane, delicate, 1/25 to 1/10 inch long, truncate. 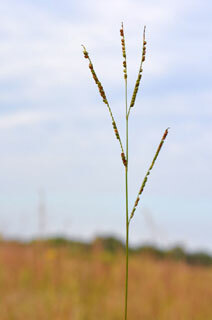 Inflorescences: Racemes, usually 2-5, erect to loosely ascending, thick, 1.6 to 6 inches long; rachis flattened, zig zag. Spikelets: Crowded, nearly sessile, single or mostly in pairs on 1 side of rachis, usually overlapping, 1-flowered, nearly circular to broadly elliptic, 1/7 to 1/5 inch long, about 1/8 inch wide, pale, glabrous; first glume absent; second glume broadly elliptic to nearly circular, 1/7 to 1/6 inch long, 5-nerved, slightly wrinkled; tip rounded; sterile lemma similar; fertile lemma firm, smooth, shiny. Habitat: Low, sandy open areas, prairies, pastures, open woods, roadsides, stream banks, disturbed areas; moist to relatively dry soil. Toxicity: Ergot fungi can occur in some paspalum species, but is not considered a problem in Florida paspalum.